Bored with your vegetables these days? What you need is a good trio—the Luke, Leia and Hans of dinner! Brussels sprouts, butternut squash and apples are the unlikely characters to connect this veggie plot together. 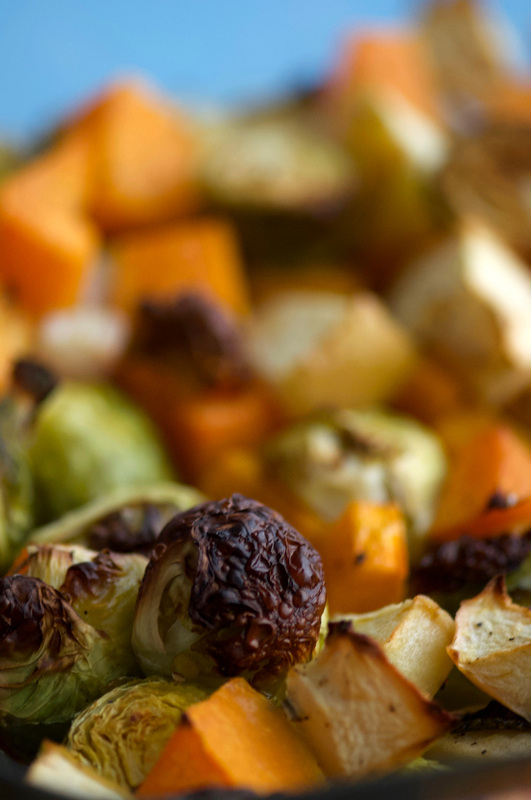 Roasting brings out the caramelized bitterness of the sprouts, the earthy sweetness of the squash and honey-tart apple flavours in the most perfect way. 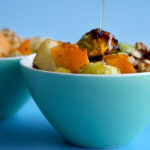 Add some fresh herbs, walnuts for crunch and drizzle with maple syrup for a vegetable dish that is totally delish, yet super healthy at the same time. 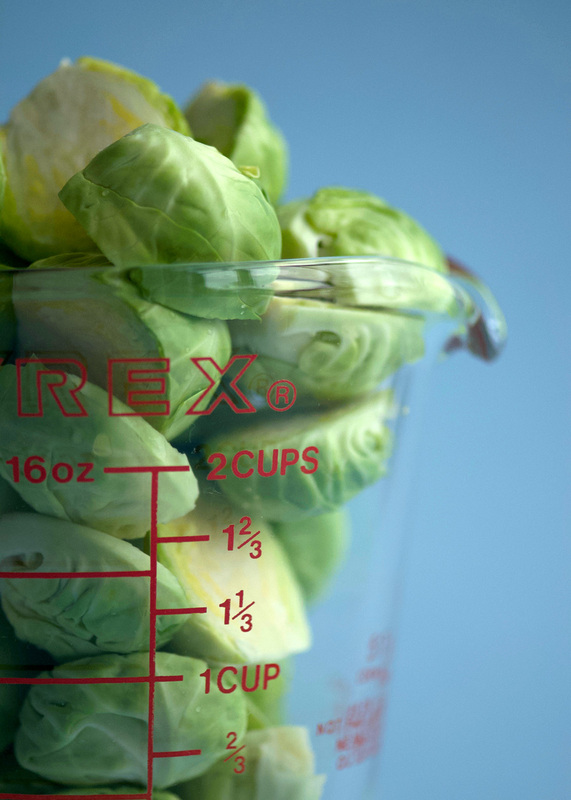 To begin, prep your brussels sprouts by removing the outer leaves, trimming the bottoms and slicing them in half (for really large sprouts, cut into thirds or quarters—the goal is for all the pieces to be roughly the same size for even roasting). I find a heaping two-cup measuring cup does the trick, you don’t need to be too precise. Next, chop up your butternut squash (about 2 cups as well). I like to buy a package of pre-cut squash from the store. It saves all that prep time peeling the skin, and a whole butternut would be too much for this recipe. No need to peel the apples, just cut them up into half-inch pieces and toss everything together in a large 9×13″ baking dish, with some shallots and some fresh rosemary, thyme or sage, whichever you have on hand. Season generously with salt and pepper, drizzle with some olive oil, and stir it all together. 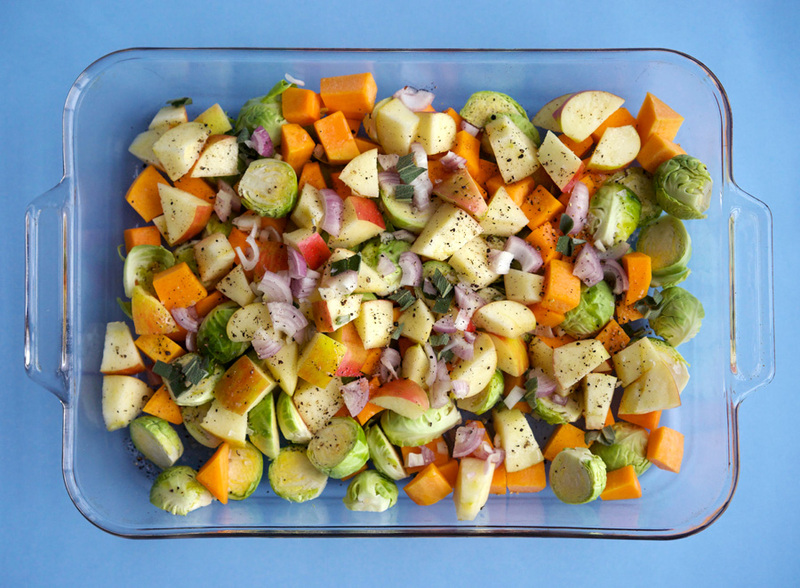 Roast, uncovered, for about 35–45 minutes until the edges of the squash and outer leaves of the sprouts are dark and golden. No need to stir, just let it roast in place to get all those nice dark golden bits. The photo above gives a good idea of how the vegetables should look when they are ready. Aren’t roasted brussels sprouts just gorgeous?! Finally when serving, I like to let people grab their own walnuts to place on top, and drizzle the maple syrup on top to their liking. Overall the combination is so simple and so good. It makes a great side dish with pork chops. With more walnuts and maybe a bit of goat cheese, this could also be a meal on it’s own. Who said vegetables can’t be the star of dinner? With the right trio, veggies triumph over all. May the syrup be with you! The perfect trio of vegetables to shake up your vegetable routine. Toss first seven ingredients in a 9x13" baking dish. Roast in a preheated 375° oven for 45–55 minutes. Veggies are done when there are dark golden areas on the outer brussels sprout leaves and squash. 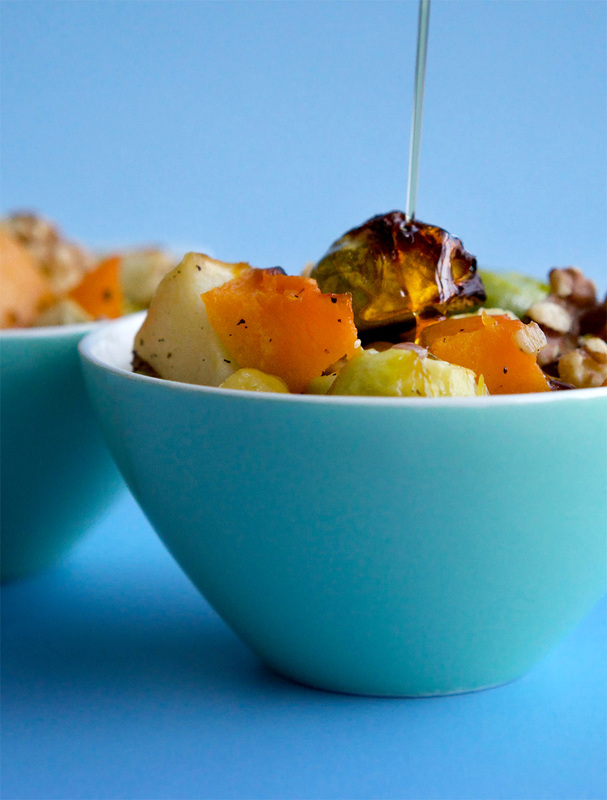 Serve with maple syrup and walnuts on the side, for each person to top up their veggies as desired. 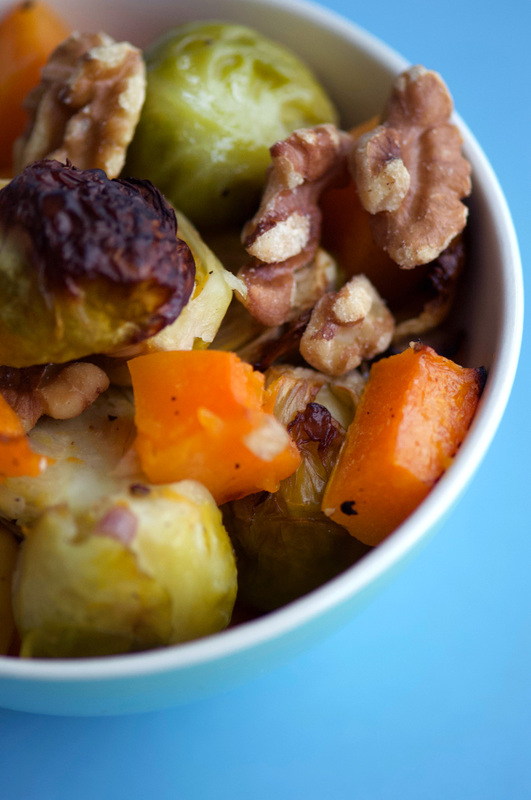 Recipe inspired by The Occasional Vegetarian’s Roasted Brussels Sprouts, Butternut Squash, and Apple with Candied Walnuts on Serious Eats.